Songkran is celebrated by dousing friends and strangers with water and wiping a mixture of chalk powder and water on people’s faces. Both are meant to be symbols for the substances used by monks to bless people and anyone who goes outside should be prepared to be soaked and covered in chalk. The main soaking in local neighborhoods comes from groups of people standing on the side of the street. There is usually a giant bucket or garbage pail filled with water that people scoop water out and dump on any passing pedestrian or vehicle. It’s very funny to see the cars and rickshaws (tuk tuks) get doused, but a bit scary when a motorcyclist gets a gallon in the face while driving. Danger not only lurks from the side of the road, but from other motorists as well. Pickup trucks are weighed down with people taking part in Songkran while tuk tuks, which have no doors and are completely open, offer a prime spot to launch an attack from a moving target. My favorite sight is two tuk tuks matching each other speed-wise as the passengers of both engage in a water gun battle. While we had a great time watching the tuk tuk fun, we one time made the mistake of getting into one along with a few new friends. As five of us crammed into a vehicle barely big enough for three, we quickly realized we were sitting ducks. The driver was intent on slowing down at ever corner that had people with water and we spent most of the 20 minute ride having buckets of water tossed at us with nowhere to hide. All in good fun, but I had my camera bag unprotected and we were actually en-route to the mall to see a movie with air conditioning to cool off a bit. Those plans changed when we were all soaked. Once you get out of the vehicle scene, many streets are actually closed off to allow for massive water gun fights. We visited one of them in the Patpong area one evening and the scene reminded me a bit of a much more tame Mardi Gras: minus the flashing. Packed with young drunken Thais and tourists, we watched as everyone doused each other in water and chalk, boozed it up in the streets and had a huge dance party. We were there joining the fun until nearly 2am, and when we left the festivities were still going strong. 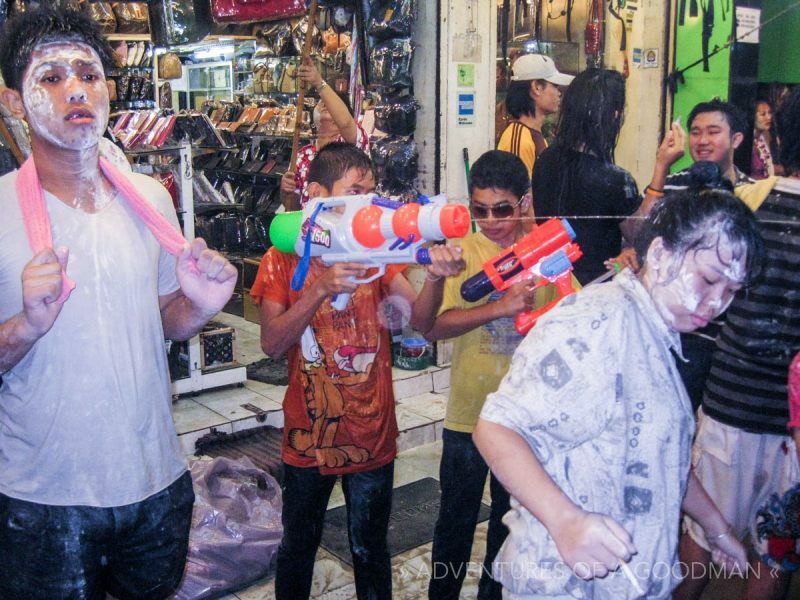 It honestly doesn’t matter where one goes during Songkran in Bangkok, as people are celebrating everywhere. One night we went to a local bar to see a show best described as a karaoke show with a live band and a dance group dance off. It was like nothing I have ever seen before and made all the more fun by the random 50 year old American whose table we joined and later learned it was his birthday. Anyway, the bar turned into a Songkran playground by the end of the night with ever table, and our bodies, covered in water and chalk. Another day we were just innocently walking around a mall when Songkran found us there. Right in the middle of the stalls that lined the walkways people were throwing water on each other…and on their shops. Many had tarps over their merchandise and all had signs that said, “no water please,” which was clearly there for show only. All in all, we spent much of our time in Bangkok wet.